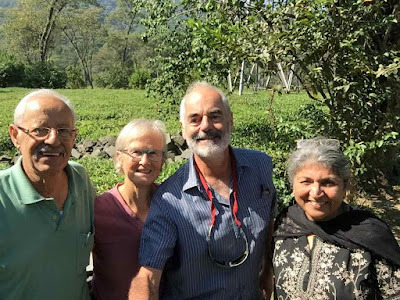 We went down into the Kangra Valley which runs below Dharamsala to stay on the Darang Tea Estate. This turned out to be a real 'homestay' - living in a room in the bungalow, eating with the family (lots of their fruit and veg), and shouting at rather deaf but still very bright 93-year-old granny. Even a chota peg before dinner. 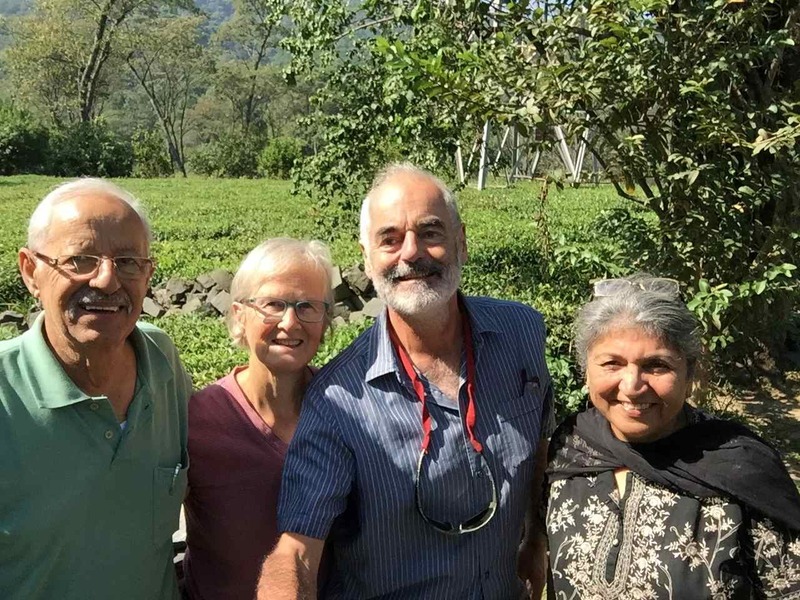 Here we are with Naveen and Neera, with the tea plantation behind. This is using my selfie stick, which is taking all my concentration. We went off to the Sherabling Tibetan monastery which was very fancy - in fact 'bling' is the right term. 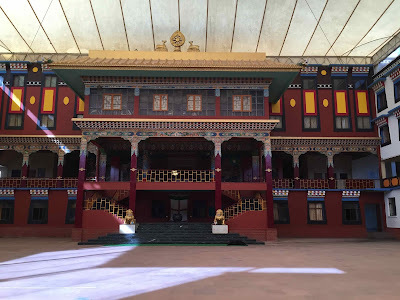 The Dalai Lama's temple in Macleod Ganj is very modest indeed, but this was the full business - big campus in a forest, huge buildings, and the main temple and courtyard that had all been roofed in. Got to see some great practice - huge drums, trumpets, and a massive gong to get the monks back from their break. Then, rather bizarrely, we headed off the the landing site of the World Para-gliding championships which were due to start the next day at Bir, just down the road. 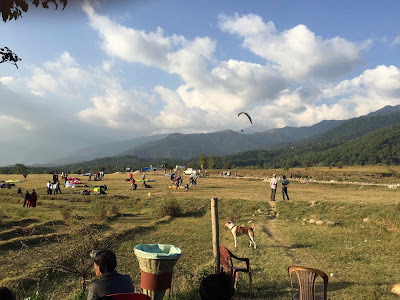 All very beautiful and Himalayan, with a sky full of practicing paragliders, although the landing site was rather Indian, with stray dogs, chai stalls etc. 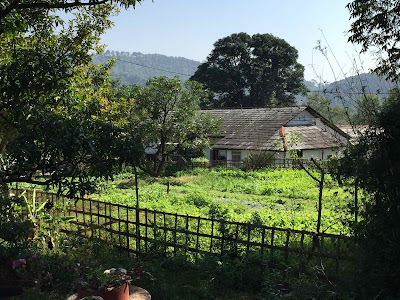 And, in spite of its name, Bir was a dry town and so I am not sure how all those para-gliders felt about not getting a drink at the end of the day. 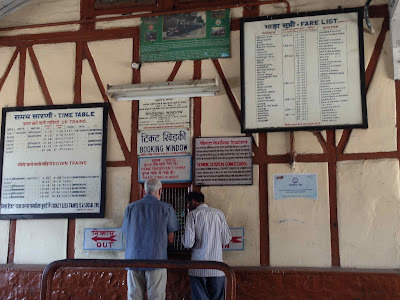 The next day came the major treat - a ride on the Kangra Valley Railway, a 100-mile narrow gauge built by the British in 1929, and still going strong. 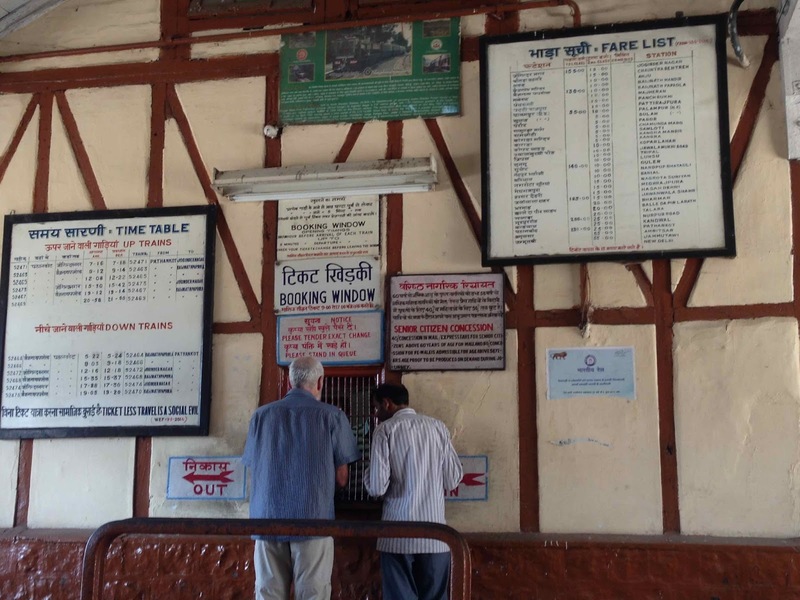 Worked out the time-table and fares, which was 10 rupees each (10p). 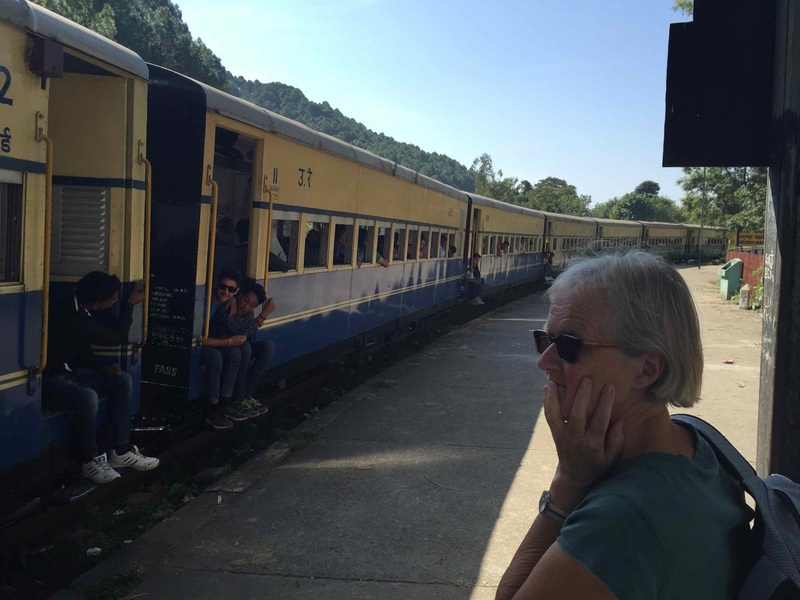 The average speed of the train was less than 20 mph, and it was clean and cool inside. But clearly the thing to do was to sit on the step as we trundled along. Which I did. 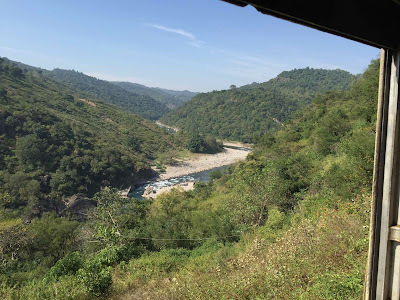 Some of the landscape was spectacular - rattling along looking down gorges in the sunshine. 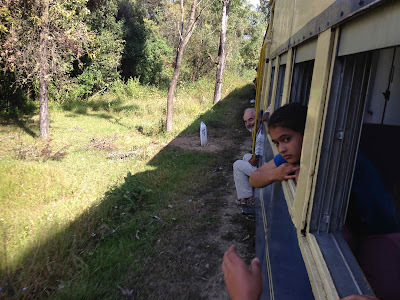 Finally, if the video works, it shows us going over the curved viaduct just before Jwalamukhi Road - such excitement!